Native Americans were the first humans to attract breeding pairs of Purple Martins using Purple Martin bird houses. They would use hollowed out gourds hanging from trees to promote nesting. No one truly knows when this practice started, but it is thought that it was done to help the Native Americans control flying pests. Mating pairs of purple martins would protect their houses from predators like crows and hawks, which in turn protected the Native Americans’ food crops. They soon found an added advantage to having Purple Martins around was that they consumed large quantities of flying insects. The Native Americans quickly learned that hanging more gourds meant fewer flying insects. Purple Martins started to rely on the artificial bird houses provided by humans and, today, the Purple Martins in the eastern area of North America are wholly dependent on martin bird houses for breeding. Purple Martin bird houses are made from wood, plastic and metal. There are also natural and plastic gourds used as Purple Martin houses. 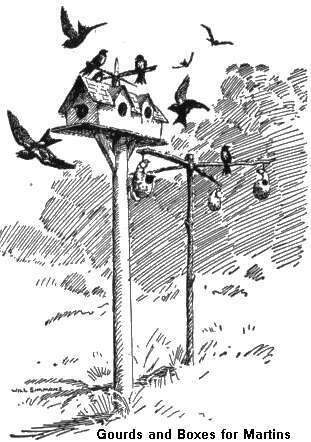 Regrettably, not all commercially made martin bird houses are properly designed to protect a colony of Purple Martins. Since Purple Martins are completely dependent on nesting sights supplied by humans, it is crucial that the housing provided for nesting satisfy a few minimum requirements. Martin houses should be easily accessible for inspecting nests and performing general maintenance. Climbing up tall ladders is dangerous and tipping houses does not work well. A system that permits the house to be lowered and raised vertically works the best. The size of the nesting compartment is crucial. Each compartment should be at least 6 inches wide x 5 ½ inches high and 9 inches deep. A larger size is alright, but any thing smaller will not work. A nesting compartment at least 9 inches deep will provide enough room for the family of Purple Martins to escape the reach of flying predators like owls. White martin bird houses (including gourds) are better than dark colored ones. Research has indicated that white houses are 10 to 15 degrees cooler than dark ones. Houses that get too hot could cause fledglings to jump out of the nest before they are ready. Nesting compartments should be accessible through hinged or removable panels. As a landlord you’ll have to clean out old nests, perform nest checks, control insect pests, get rid of unwanted pest birds and perform general maintenance. The Purple Martin Conservation Association (PMCA) is a nonprofit organization devoted to purple martin research and increasing martin populations in North America. Read: Attracting and Managing Purple Martins for detailed information. Free information sheets are also available on a variety of topics related to Purple Martins. PMCA invites interested people to participate in several Research Projects, including an online migration watch, colony registration, and Project Martinwatch, which involves filling out nest check forms and submitting them at season’s end. Proper ventilation is crucial. Several ½” diameter holes at the top of the nesting compartments will allow for ample air flow. This feature is much more important in the southern breeding areas. Controlling heat in the nesting compartments will actually increase the survival chances of young birds. Starling Resistant Entrance Holes (SREH’s) are very important to the survival of the Purple Martin colony. Many martin houses are fitted with SREH’s, but if your martin bird house is not, adapters can be bought or made. There are many styles of SREH’s but the height must be precisely 1 3/16 inches high. This is crucial since anything larger and European Starlings will be capable of getting inside and anything smaller will stop the Purple Martins from getting in. New research has shown that porches inside and outside the compartment are very beneficial. The porches should be at least 3 inches x 3 inches. They should be located no more than 1/8 inches beneath the bottom of the crescent shaped opening. These porches help the Purple Martins negotiate the tighter openings while making it more difficult for European Starlings to get inside. Purple Martins have several predators but the European Starlings clearly do the most damage. European Starlings were introduced into the U.S. in the 1800’s. The trouble is that the starlings take over the nests of Purple Martins. They are very hostile nesters to the point that they will kill nesting Purple Martins to take over the nest. Since martins only produce one brood per year this is devastating to population levels. If you have starlings nesting in your martin bird houses they must be eliminated. House sparrows are another problem bird that is not native to the U.S. They likewise must to be removed when detected in martin bird houses. Once you are ready to establish a Purple Martin colony you need to decide on the best location. Purple Martin bird houses should be as far away from trees as possible. A good practice is to keep your martin bird house as far away from trees as possible. If a tree is 50 feet tall the house should be at least 50 feet away from that tree. Tall trees conceal predators that prey on Purple Martins like hawks and owls. Martins are sensitive of this risk and will not nest in a place where they don’t feel safe. The more open the area is around the martin bird house the greater your chances are for attracting a colony of Purple Martins. Providing a nesting place for a colony of Purple Martins is a big commitment. It demands you, as the landlord, to get involved. You will have to monitor the martin bird house for unwanted nesting competitors, perform routine nest inspections and clean the nesting compartments. Keeping Purple Martin bird houses in your yard takes some work, but it is worthwhile. These gorgeous wild birds are a joy to watch and beneficial to our environment, but they need our help for survival.